Baldwin has a 60 year legacy of craftsmanship and innovation. Rated #1 in quality by builders and contractors, Baldwin is pleased to offer a line of luxury hardware for the discriminating consumer, our Prestige Series. Feel the difference - Baldwin hardware is solid throughout. With a 60 year legacy of superior style and quality, Baldwin is the choice for an elegant and secure presence. Exuding a sense of timeless beauty, the oval shape and sophisticated lines of the Carnaby knob make a lasting impression. The Venetian Bronze finish is hand-rubbed to reveal unique bronze highlights and provides a rich and warm complement to the product's style. Both knobs/levers can be locked or unlocked by key on the outside, or turn button on the inside. SmartKey Re-key Technology allows you to control who has access to your home. Re-key the lock yourself in seconds in 3 easy steps. Have you recently moved or had a child lose a key. Its time to re-key. SmartKey provides the highest level of residential security and features BumpGuard to protect against lock bumping. The Amerock BP29368CBZ Candler 1-1/2in(38mm) LGTH Knob is finished in Caramel Bronze. The Candler collection is distinctively elegant, with strong lines and soft curves that blend a touch of femininity with enduring class and timeless character. Amerock's Caramel Bronze finish has a rich dark brown hue with a hint of burgundy and subtle copper undertones. The Amerock BP29340CBZ Candler 1-1/4in(32mm) LGTH Knob is finished in Caramel Bronze. The Candler collection is distinctively elegant, with strong lines and soft curves that blend a touch of femininity with enduring class and timeless character. Amerock's Caramel Bronze finish has a rich dark brown hue with a hint of burgundy and subtle copper undertones. The Schlage Georgian Knob Non-Turning Lock in Aged Bronze is commonly used as a decorative pull for doors that don't require latching. The Georgian knob's design is inspired by Georgian-style homes in New England. Its symmetrical detailing is highlighted by our Aged Bronze finish featuring warm, copper tones that break through its darker, aged exterior. Plus, it's been designed and tested with strength and durability in mind. The Elements Series<sup></sup> provides an expanded choice in Fashion Doorware at an affordable price. In decorating your home, choosing the right paint, wallpaper, tile and trim is important in creating a personal design. The Elements Series of Fashion Doorware will support and enhance your decorating decisions. Simple, elegant, and clean, the Fairfax knobs fits snug in the palm of your hand Both knobs/levers can be locked or unlocked by key on the outside, or turn button on the inside. The complementary Antique Brass finish offers a warm feel with deep accents in the contours of the product. Prestige Carnaby Venetian Bronze Entry Knob with SmartKey Baldwin has a 60 year legacy of craftsmanship and innovation. Rated #1 in quality by builders and contractors, Baldwin is pleased to offer a line of luxury hardware for the discriminating consumer, our Prestige Series. Feel the difference - Baldwin hardware is solid throughout. With a 60 year legacy of superior style and quality, Baldwin is the choice for an elegant and secure presence. Exuding a sense of timeless beauty, the oval shape and sophisticated lines of the Carnaby knob make a lasting impression. The Venetian Bronze finish is hand-rubbed to reveal unique bronze highlights and provides a rich and warm complement to the product's style. Both knobs/levers can be locked or unlocked by key on the outside, or turn button on the inside. SmartKey Re-key Technology allows you to control who has access to your home. Re-key the lock yourself in seconds in 3 easy steps. Have you recently moved or had a child lose a key. Its time to re-key. SmartKey provides the highest level of residential security and features BumpGuard to protect against lock bumping. 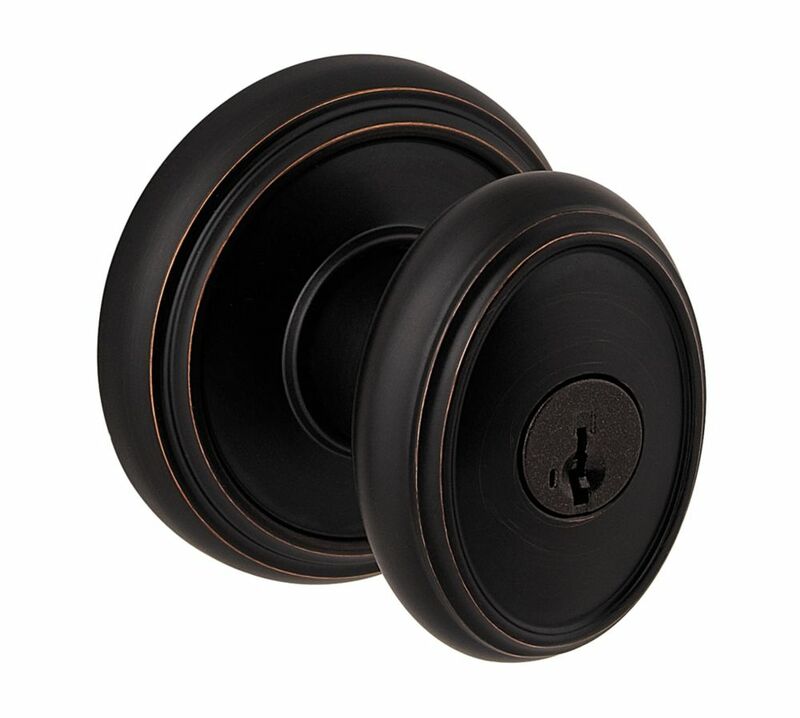 Prestige Carnaby Venetian Bronze Entry Knob with SmartKey is rated 4.6 out of 5 by 16. Rated 5 out of 5 by George from Very high quality, considering replacing other door hardware with... Very high quality, considering replacing other door hardware with Baldwin, although Baldwin is much more expensive. You get what you pay for. Rated 5 out of 5 by Nonnie from It’s perfect! We bought it to go in a room... It’s perfect! We bought it to go in a room we just did over. The look we wanted was rustic so it was exactly what we were looking for. Rated 5 out of 5 by UnderHisEye from I have zero complaints about this product. Looks great and relatively easy installation - appears... I have zero complaints about this product. Looks great and relatively easy installation - appears well made; very solid. I’d definitely recommend. Rated 4 out of 5 by Colleen from Very easy to install. Very good quality. The only thing I did not like was the fact they put a st... Very easy to install. Very good quality. The only thing I did not like was the fact they put a sticker around the knob. First off it was hard to read, and second, it was hard to remove all the sticky residue left over. The sticker said something like do not drop knob. Overall I would recommend. Rated 1 out of 5 by Kennedy from Set screw problem On my second knob.. first was pre opened and missing parts.. second one set screw on outside won’t except Allen key??? Rated 5 out of 5 by lkailing2858 from Beautiful!... Beautiful!